Country Music ChicagoYour source for country music in Chicago! This is not a rockin, boot scootin’, stompin’ country music album. It does not have the big band sound that most mainstream country music performers have. This is an ethereal album that has an incredibly unique sound that creates a mood. 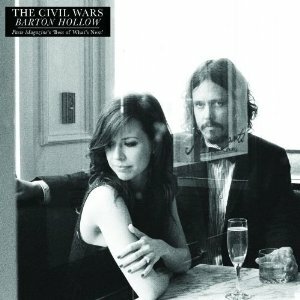 This is Barton Hollow, the debut CD of the country/folk duo The Civil Wars. The Civil Wars do not have a back up band. A back up band would destroy their refreshing unique sound which includes John Paul White’s vibrato, Joy William’s sweet innocent rich voice, incredibly blending harmonies and a haunting quality to each song. Listening to each song transports you to another place and time; and creates an ethereal experience which is almost surreal. All twelve songs were written by John Paul White and Joy Williams. Chris Lindsey collaborated on Poison and Wine. In each song, White plays acoustic guitar with a bare minimum of back up. Each song has acoustic guitar, a blue grass Appalachian sound, blending harmonies and a haunting, whispering quality. The combination of White’s vibrato with Williams’ sweet innocent almost child like voice is amazing. As much as each song has similar qualities, they are also very different. These tracks are not cookie cut copies of each other. One song The Violet Hour is pure instrumental. It is beautiful, and has that same haunting quality that all their songs have. The song ends with the sound of bells in a clock tower which adds to the soulful,mournful yet ethereal beautiful sound that comprises this whole album. Forget Me Not is a strumming on the back porch type of love song. You can picture him in a rocking chair strumming and singing to her as a gentle wind ruffles the corn stalks. In Birds of a Feather, they alternate lines which makes it sound like they are talking to each other. Then they sing together, his vibrato with her sweet harmony creating that beautiful effect again. Artistically speaking, this album is superior. The acoustic nature of the music, blue grass Appalachian quality, the haunting whispering echos combined with White’s vibrato and William’s harmonizing create a musical experience that is not only superior but pure pleasure. It is so good to listen to something different than the usual yet still has the qualities of great country/folk music that we all know and love. Their second CD will be highly anticipated.